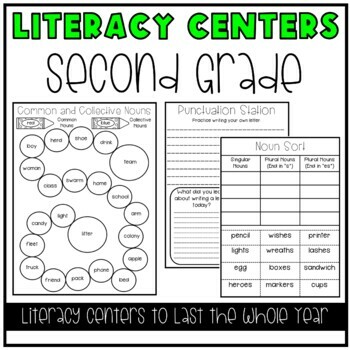 This product is an entire year of Literacy Centers for 2nd grade students. 36 Weeks (Approximately 700 pages) of Literacy Center Activities! 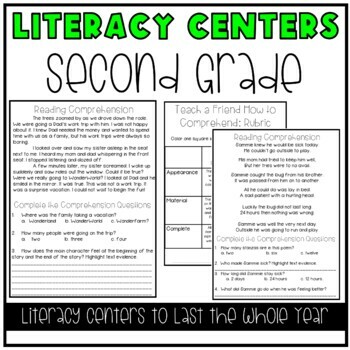 Centers include hands on activities, partner activities, and gives the students great exposure to reading comprehension. Each week contains one activity for you to leave in the center for the entire week. 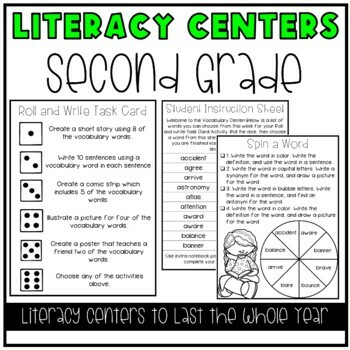 Students are meant to rotate to that activity throughout the week as well as other centers. A rotation schedule is given as well as a guide to use on how to use this product appropriately. 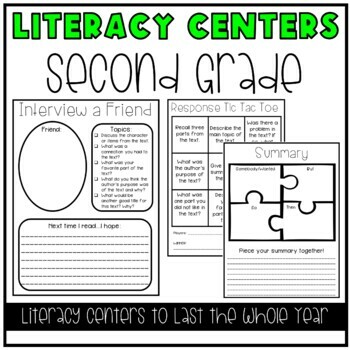 Each center activity includes a student instruction page for you to print off and leave in the center all week. These are print and go centers, no prep required except providing a book! If you are looking to see some real photos of these, check out my Literacy Center Photos to see how these look on colored paper and paired next to each other! *NOTE* Some of these activities are the same each six weeks, but the students will create different versions of them. This helps the students understand what activity they are doing and get into a routine with centers. If you are looking for separate centers and not the bundle, go check out my custom category with all of the individual centers listed. The bundle with save you money in the long run, but I know it is a large purchase! Please e-mail me at Hillary3986@gmail.com with any questions prior to your purchase! Thank you! Products by Hillary's Teaching Adventures, LLC may be used by the purchaser for their classroom use only. This is a single classroom license only. All rights reserved.